Escaping from the chill that January curses upon us (yes, it is STILL January), I pop in for a late lunch at our newest Portico Place, where the warming interior instantly captures me and I'm quick to forget about the minus temperatures I’ve just come from with my thoughts turning to my rumbling belly as I’m ushered over to a cosy booth to the right of the restaurant. 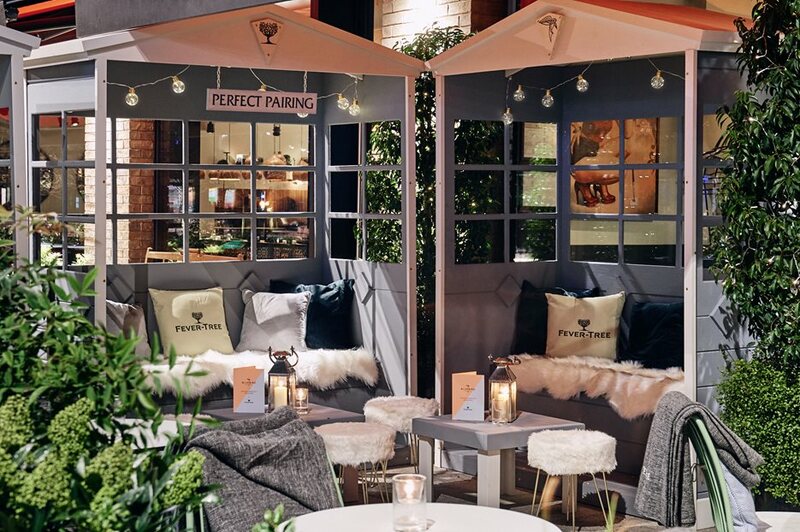 Located in the Television Centre, White City, Bluebird Cafe is in prime position, with its welcoming outdoor seating decked with rugs for the winter so you can snuggle up and enjoy a cocktail or two outside. Once inside the restaurant the front window holds a couple of swinging chair pods, perfect for a catch up or people watching - Bake Off fans, extra slice is filmed here so plenty celeb spotting to keep you entertained! As dry January is a concept I am yet to grasp (January is a tough enough month, let’s not make it harder!) but still wanting to abstain from something at the beginning of the new year after a gluttonous Christmas, I’ve opted for a month off meat. Lucky for me Bluebird’s menu is not short of delicious vegetarian and fish dishes, making it very difficult to pick just one thing from the menu...so I don’t! I opt for crisp fried squid to start which when it comes out it is draped in chillies, spring onions and lime wedges accompanied with a jalapeno aioli adding the perfect kick to the dish. And to water this all down I pick a crisp glass of New Zealand Sauvignon Blanc. Following on with a fish theme and with another glass of wine in hand, I’ve ordered the lobster and prawn roll which had caught my eye not only on the menu but also Bluebird's Instagram page, which I do not advise looking at when you are hungry! The lobster and prawn is mixed together in a deliciously juicy thousand island dressing and served on a moreish brioche bun, accompanied with what felt like a never ending pot of fries! My late lunch booking has fallen into the early hours of the evening and the restaurant is starting to buzz with even more people escaping from work and eager for a Thursday night drink, the bar is busy with cocktails being shaken and dished out to it's ready and waiting guests. Thinking I certainly couldn't fit another course in and the cocktail menu has been eyeing me up all evening I decide to try the Bluebird espresso martini - best of both worlds really! Creamy, sweet and delicious just how I like my puddings but with a kick to warm me up for the weather outside! Full and satisfied after an extended lunch it's time to roll myself home. Bluebird White City is definitely one to add to your list if you are yet to visit, perfect for a mid-shopping lunch to refuel or evening dinner and drinks. Don't forget to show your Portico Places card and get 20% off your total food bill. Enjoy 20% off your food bill!